A World Health Organization (WHO) case study carried out in two Tamil Nadu villages shows the link between limited access to pesticides and the reduction in the number of suicides. A WHO report based on the study says that the suicide rate in these two villages reduced after pesticides were kept in storerooms instead of individual houses. Pesticides are easily available in rural households where farmers use these poisonous chemicals to kill weeds and control pests. The study was conducted in Kandamangalam and Kurungud, about five hours from Tamil Nadu's capital Chennai. In this area, the villagers’ main source of income comes from cultivating flowers such as jasmine and firecracker. Farmers spray pesticides on the flowers every fortnight to ensure a bumper produce. WHO started the study in 2010, and after a year, both the suicide rate as well as the attempt to suicide rate declined from 33 to 5 per 100,000 due to the limited availability of pesticides. To prevent suicides, a central storage facility was constructed in these two villages where farmers were told to keep their pesticides. Now, every family has its own wooden locker for storage. 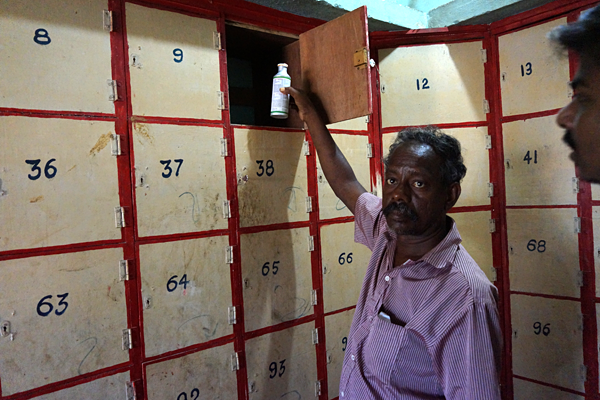 Farmers have access to storage boxes between 7am and 7pm daily. Two locals guard the building and maintain a register to keep a record of the boxes used. The WHO report states that suicide is preventable and urges communities to adopt comprehensive and multi-sectoral prevention strategies, including restricting the access to suicide means. According to the health agency, India has one of the highest rates of suicide in the world. In rural regions, poisoning accounts for four in 10 suicides due to swallowing of pesticides. The suicide rate is high in villages as the country has a large agriculture sector and 60 per cent of its population depends on farming for earning livelihood. “This leads to many Indian farmers keeping their pesticide supply within easy access, for example by storing it in the family home. Pesticide ingestion is one of the most common methods of suicide globally,” the study says. Among Indian states, Tamil Nadu reports one of the highest rates of suicide. In 2012, the rate of deaths resulting from suicide in the state stood at 24.9 per 100,000, higher than that year’s estimated global average of 11.4 per 100,000.
WHO states that 75 per cent of all global suicides occur in low- and middle-income countries. Out of this, the contribution of South-East Asia alone is 40 per cent. An estimated 804,000 suicides were reported worldwide in 2012. Globally, suicide accounts for 50 per cent of all violent deaths in men and 71 per cent in women. Suicide was the second leading cause of death among the age group of 15–29. Suicide rates are highest in people aged 70 or above for both men and women in almost all regions of the world. However, in some countries, suicide rates are highest among the youth. Ingestion of pesticides, hanging and use of firearms are among the most common methods of suicide worldwide, but many other methods are also used, often varying according to local conditions.